Elna Barker is similar to the characters in Candace Bushnell’s and Jennifer Weiner’s novels, a single woman looking for love and her own identity in New York. 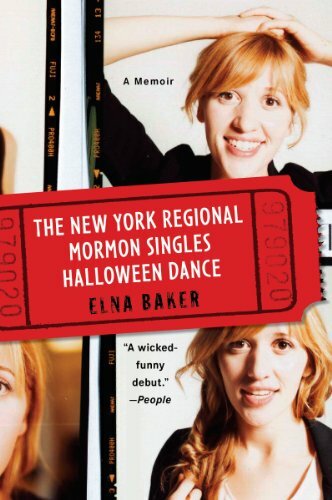 What makes Baker stand out from the others is that she is Mormon and her memoirs discuss the difficulties of not only being a single woman, but being a single Mormon woman in New York City. Baker has a clear witty style to her writing that sees humor in many things. She writes of the title dance as a place where “Manhattan Mormons meet, marry and make more Mormons (take that, Sally and your seashells by the seashore).” She goes to these events that serve punch and cookies, hold embarrassing mingle sessions, and features people dressed in ridiculous costumes dancing to “Cotton Eyed Joe” and “The Electric Slide.” Though Baker vows that she will never go, she always does to meet the man of her dreams and hopefully marry him. Baker’s romantic journey is a study in various men and misconceptions caused by her and the men. They range from her first kiss from a neighbor boy to a necking session in a swank nightclub with “Warren Beatty” (a famous actor that she won’t name, but gives Beatty’s name as a pseudonym). By far, the strongest relationship is with Matt, a bright intelligent atheist who she believes would be her soul mate except, as Baker writes, “he doesn’t believe in souls.” Her chapters with Matt are lovely, but ultimately upsetting as neither can really come to terms with their differences.